Advantages: Knowledgeable author, excellent range of “rare” archive images, superb general arrangement and structural drawings, competent artwork. Conclusion: Completely revised publication that supersedes the previous Datafile on the type. 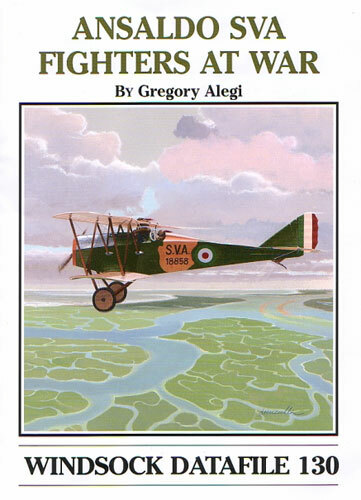 An excellent “one stop shop” for the modeler of Ansaldo SVA fighters. Gregory Alegi is no stranger to the SVA. Within the last 15 years, this is his third title on the subject for Albatros Productions. Datafile 130 concentrates on the Ansaldo fighters and its intention is to replace the now out of print DF 40. There is plenty of new information and the author’s knowledge on the topic leaves little to be desired. This is not a rehash of the original single-seat monograph. The narrative is totally original and gives the reader a better understanding of SVA’s evolution in the Italian aviation industry. There are nearly 100 photographs contained within the A4 sized soft card covers. The format allows for plenty of detail so maximum benefit is gained from the images. Martin Digmayer contributes with 4 pages of general arrangement drawings and these can be found in both 1:72 and 1:48 scales. Structural illustrations are another feature of this book and this time they are based on original manuals rather than replica aircraft. Naturally this results in greater accuracy. The text is easy to read with more details being included on the origin and service of the aircraft. All this is capped off with appendices that cover squadron use, post-war use and a list of applicable serial numbers. Artwork is not forgotten and here we see Ronny Bar showcase his talent with three splendid colour profiles. A colours and markings section compliments this as well as a commentary on the aircraft’s national insignia. Once again the modeler gets an ideal reference source for another prominent single-seater. When it comes to Italian aircraft the SVA is one of the best known and it is fitting to have a publication such as this devoted to their fighters.